The U.S. Army Corps of Engineers oversees the demolition on Saturday of a home in Breezy Point, N.Y. The house floated off its foundation during Superstorm Sandy and came to rest in the middle of Beach 215th Street. 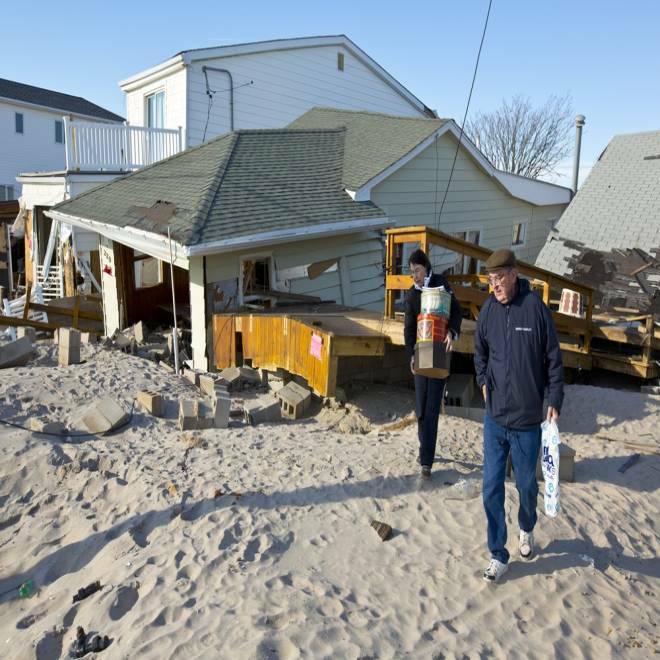 BREEZY POINT, N.Y. -- The bulldozing of homes ruined by Superstorm Sandy has begun in this seaside enclave, but residents are only beginning to come to terms with the costly and complicated process of rebuilding. Neatly dividing what was from what will be, an excavator on Saturday methodically tore down the first badly-damaged Breezy Point home -- a one-story, white home that floated between 150 and 200 feet into the middle of Beach 215th Street during the Oct. 29 storm, apparently stopping only when it slid up against a light pole. While the beginning of demolitions is an important milestone on the road to rebuilding, it left resident Tom Ryan, 64, a neighbor of the homeowner, feeling melancholy. What Ryan has been seeing is a period of uncertainty in Breezy Point, a private cooperative founded more than a century ago by Irish immigrants. Sandy’s flooding is believed to have triggered a devastating fire that burned down 111 homes in one of the older areas, known as “The Wedge.” And the storm surge damaged more than 2,000 other residences, some of which also are not salvageable and are now about to be removed. Overall, the storm destroyed 200 buildings and left another 200 unsafe for habitation in the New York City boroughs of Queens, Brooklyn and Staten Island, Department of Buildings spokesman Tony Sclafani said Friday. Many of those structures, which are tagged by “red cards,” will ultimately be demolished in the coming months, he said. Buildings blocking public rights of the way are the first structures being cleared in New York City, an operation being run by the U.S. Army Corps of Engineers. The removal of these roaming residences will soon be followed by the demolition of the badly damaged structures on private property, a process that the city will oversee. Some hired structural engineers, hoping that their homes could be saved. But in many instances, the answers were not what they had hoped to hear. Among those getting the news that their home would have to be torn down were Jerome Hoffman, 62, and his wife, Madeline DiLorenzo-Coscia, 63, who had hoped to put the bungalow back on its foundation but found out that wouldn’t be possible. Madeline DiLorenzo-Coscia, 63, and her husband, Jerome Hoffman, 62, look at their 'little frame shack' in Breezy Point on Dec. 8. DiLorenzo-Coscia said her family had owned the doomed “little frame shack,” which was shoved off of its pilings and bombarded with other debris, for more than 50 years. Those memories include playing hide and seek under the bungalows as kids, singing tunes like “Johnny Angel” on the lifeguard stands down on the beach and going on long walks to the point, where she and her friends would read poems they’d written, then tear them up and throw them into the water. “I guess we thought that we were, you know, we were grownups or something, that we were heroines in our own novels,” she said. The couple would like to rebuild, but they’re struggling with the financial equation. Since it’s a second residence, they’re not eligible for much of the emergency financial aid available to those whose primary residences were damaged by the storm. That means they’d have to refinance their home in Brooklyn to do it and take the same sort of leap of faith that her parents did when they joined the nascent Breezy Point Co-op in 1960 as residents battled to keep their homes after a developer quietly sold the land beneath them. The co-op board said late last week that the removal of houses deemed unsafe for occupancy or unable to be repaired was expected to begin in the second week of January. The city will oversee destruction of homes on private property, while the Army Corps of Engineers takes down homes that no longer have four walls or are in the right of way, in addition to collecting debris from the city-led demolitions, said Patrick Moes, a spokesman for the corps’ New York field recovery office. The process was demonstrated on Saturday, as contractors sprayed the home that floated off its foundation with water in an effort to prevent asbestos particles from going airborne. The debris, which will be tested for asbestos, was then piled into large dumpsters lined with white tarps. Federal environmental and safety officials were onsite, and appliances were separated out so they could be disposed of properly. Workers try to retrieve any mementos that they come across during a demolition, Moes said, and on this day they saved a military-style trunk for the homeowner. NBC News was unable to contact the homeowner. Residents whose homes that stayed put on their property but are beyond saving are racing to complete forms needed for demolition. The co-op board informed them that the city, under the auspices of the Federal Emergency Management Agency, would pay for the demolition of those homes deemed to be a public safety hazard by the buildings department, but only if homeowners complete the paperwork by Dec. 31. As the demolition process beings, residents are eager to begin laying plans for rebuilding. But they must wait for anticipated new building requirements. The co-op said Saturday it is awaiting the release of new FEMA flood zone maps, which will help determine construction criteria. Such concerns are weighing on Pat and Cam Livingstone, whose small oceanfront one-story home will have to be torn down after the floodwaters raced through and thrust a neighbor’s deck against one side of it. 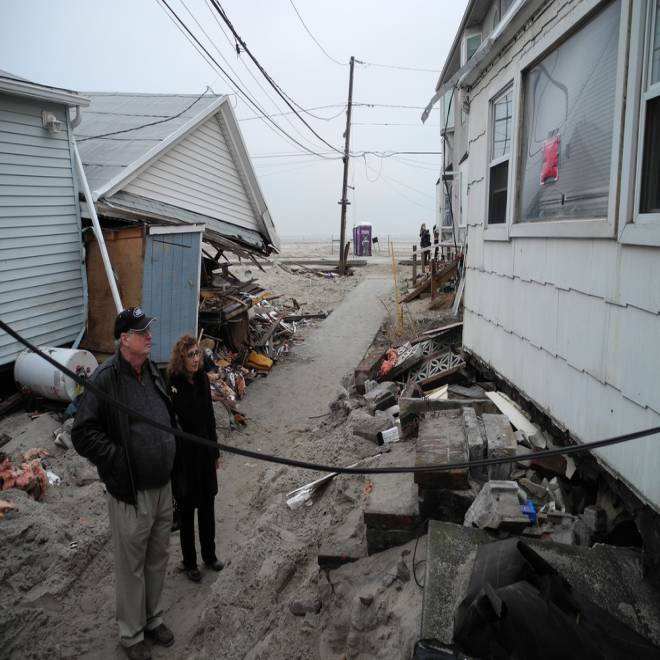 Pat and Cam Livingstone stand outside their home at 220 Oceanside in Breezy Point, which was floated off of its foundation by Superstorm Sandy. Pat Livingstone, 74, said the couple would like to rebuild. “They want to go up,” she said, referring to the expectation that authorities will require homes to be elevated several feet. “Can we walk up? Are there going to be ramps? We're pushing 80 now,” she said with a small chuckle. Cam Livingstone, 76, said the 20 years that the couple lived full time in Breezy Point were some of the best years of their lives. But now, he said, they wonder if the effort to rebuild would be worth it. Down the promenade from the Livingstones, Bob Hauck, a 58-year-old plumber, has decided it is a risk worth taking. The storm scooped his oceanfront single-story home off its foundation and plopped it down 100 feet straight back, in a sandy area. He joked that the address of his home should now be 210 Sand Lane instead of 210 Oceanside. 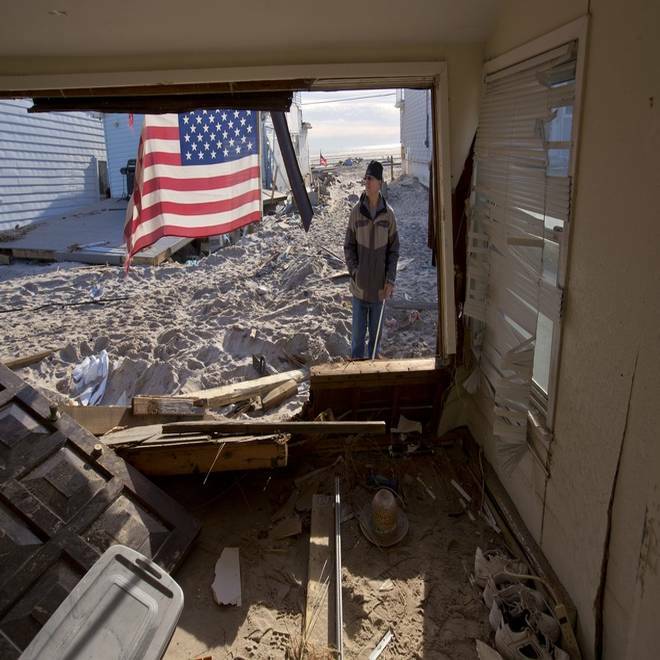 Bob Hauck looks over what is left of his home at 210 Oceanside in the Breezy Point neighborhood of Queens, NY. Gone are the picture window with a double sash that once offered a full panorama of the Atlantic Ocean, as well as the big front deck where Hauck would smoke a cigar and visitors would drop by to say hello. Water warped the floor, in places shoving it up two feet, and pushed in the kitchen wall. Hauck, a father of four adult children who started coming to this shoreline community with his parents decades ago, said he has “Breezy sands in my shoes.” It will take all of his financial resources to come back, he said, but he will do it. Hauck said he has been motivated by his neighbors, who have been quick to pick up the pieces of their shattered lives, with some even moving back in though water only just became available in one section of the community on Saturday. He’s ready to do the same.